What springs to mind when you see the term "multichannel marketing strategy?" Perhaps you envision advertising campaigns that cross over between television and social media, or you picture a team making sure your website is easily accessed across multiple types of devices. Multichannel marketing encompasses each of these concepts and many more. However, the term is not one size fits all, and the most lucrative channels vary depending on the industry. For example, the channels that perform best for a business-to-consumer products many not provide the same results for a business-to-business service. Only by knowing which channels to market on can you use this technique to its full potential. Direct online advertising is tricky. If, for example, you're a new business in a saturated market, then ranking highly for certain keywords will be a years-long process - one you don't have time for. Similarly, social media ads may be the way for consumer products, but businesses are more sophisticated in their customer journey. They aren't causal users scrolling through their phones; they're determined seekers looking for the perfect product to meet their needs. For instance, if they're looking for a new customer relationship management software, they're far more likely to type those keywords into a search engine than to poll their friends on Facebook. That said, some social media channels benefit B2B vendors. LinkedIn, for example, is strictly for professionals, so it's the perfect online social space to target business consumers. In fact, according to Business2Community, LinkedIn advertising expert AJ Wilcox noted this platform is particularly suitable for SaaS companies. 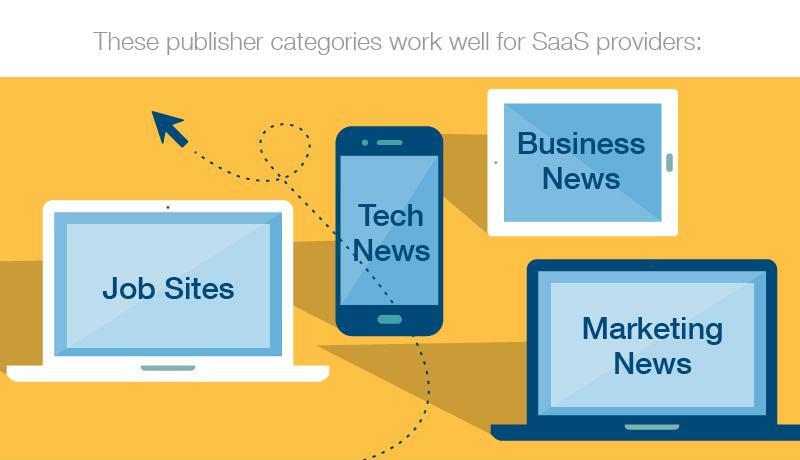 4 leading publishing categories for SaaS providers. Sponsoring content or posting ads on one of these websites gets your product right in front of the eyes of people who might need it. Even if they aren't looking for such software at the time, they'll likely remember your brand later when they start searching for such a product. "Today's decisions makers prefer to research their options first." The prevalence of content marketing in the B2B SaaS field reflects the shift in the way businesses choose vendors. Today's decision-makers prefer to research their options before engaging with salespeople. Simply creating a landing page about your product isn't enough - you must prove your product is effective with white papers, case studies and testimonials from satisfied clients. This way, businesses can do the preliminary work of narrowing down countless vendor options. To increase the effectiveness of content marketing within your multichannel marketing strategy, go beyond your product and discuss your industry as a whole. This helps potential customers view your brand more favorably. They'll see you're up to date on the latest industry trends, which implies that your product will evolve as the market changes. This type of thought leadership is a huge asset. Without these two channels, your SaaS product will easily fall behind that of your competitors. This is especially harmful in an industry where high customer acquisition rates are crucial for success. If your service operates on a subscription billing model, partner with publishers and add original content to get your product in front of the eyes of people who need it.